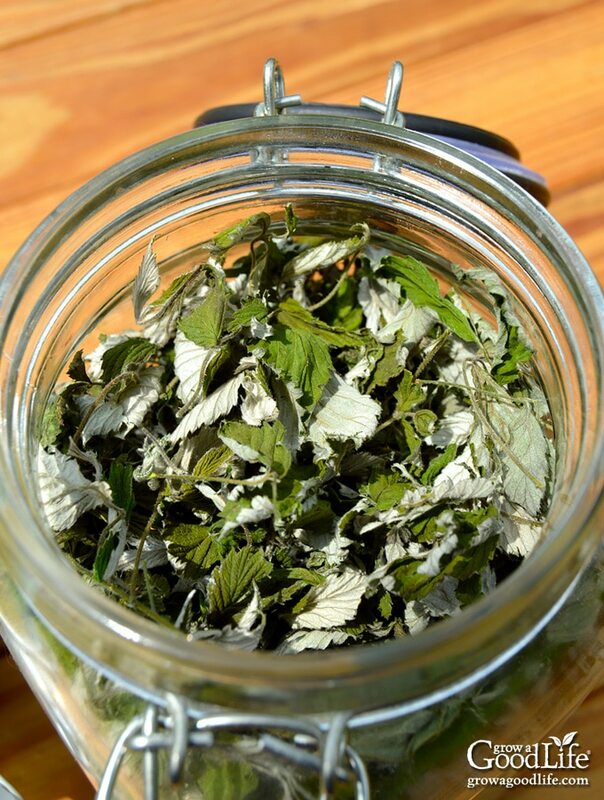 Red raspberry leaf is a delicious herb with a taste similar to green tea. See how to harvest, dehydrate, and brew raspberry leaf tea. Red raspberry leaf tea has been used for centuries as a natural remedy for conditions involving the uterus including pregnancy, childbirth, menstruation, and menopause. See how to harvest and preserve your own raspberry leaf tea. When I planted raspberries (Rubus idaeus) on the property back in 2010 it was for the delicious fruit. It was years later while researching natural remedies to ease my menstrual symptoms that I discovered that red raspberry leaf tea is a natural remedy for conditions involving the uterus, including menstrual support and menopause (Native American Medicinal Plants). 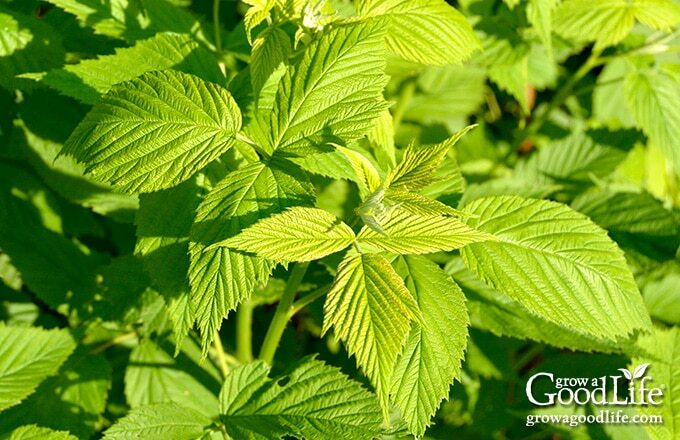 Red raspberry leaves have also been used as medicine for centuries for pregnancy and childbirth, astringent for skin irritations, gargle for sore throats, and for diarrhea. Raspberry leaf tea has no known side effects or drug interactions, but it can lower blood sugar and impede with the absorption of some vitamins (Healing Herbs A to Z). It is not known precisely why Raspberry Leaf tea is so effective for uterine health. Herbalists believe that the presence of tannins and the alkaloid fragarine combined with other nutrients, including calcium, iron, phosphorus, potassium, and vitamin B, C, and E help tone and relax the pelvic and uterine muscles (Herbal Healing for Women). After researching, I felt pretty confident in trying red raspberry leaf tea for my menstrual discomforts, and I had plenty of access to leaves to harvest. After drinking red raspberry tea for several months, it relieved a lot of my symptoms, including headache, cramps, and overall energy level and moodiness during that time of the month. I wasn’t completely convinced until I casually remarked to Kevin that I thought the red raspberry leaf tea was helping. The next thing I knew, he was outside in the raspberry patch harvesting more raspberry leaves for me to use. Hmmm…. Harvest mid-morning after the dew has evaporated and before it the sun is hot to preserve the oils and flavor. Wear gloves and long sleeves to protect yourself from the thorns. Like most herb, once the plant begins to bloom, the leaves turn bitter. Select young, healthy leaves that have not been treated with chemicals or eaten by bugs, and clip them from the cane. I grow Heritage raspberries, an everbearing variety that produces two crops each season, a light crop in July followed by a heavy crop in fall. I allow the canes to begin leafing out before pruning the raspberry patch in the spring. I cut whole canes and trim the young leaves off into a large bowl as I prune. Let the Raspberry Leaves Dry Naturally: Spread the leaves out on a screen and allow them to dry naturally away from dust and sunlight. Or you can gather the leaves by their stems, tie the ends, and hang them to dry. Depending on the humidity, drying usually takes 1-2 weeks. 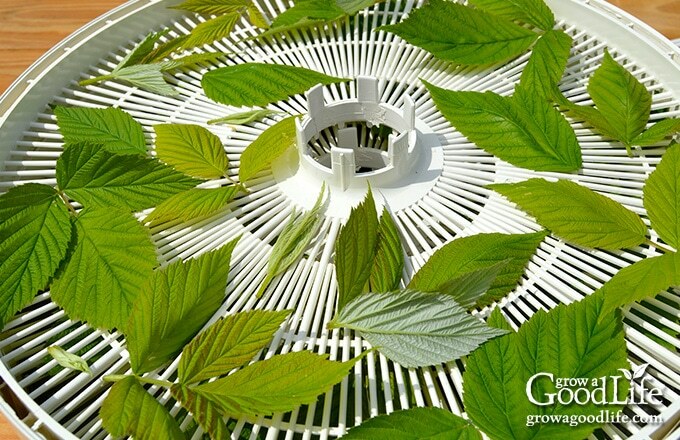 Use a Dehydrator to Dry the Raspberry Leaves: The quickest way to dry raspberry leaves is by using a dehydrator. Spread the leaves out on the screens and dry at a low temperature. Check every 30-minutes until completely dry. You can tell when the leaves are dry, by crushing a leaf or two. It should crumble easily. Once the leaves are dry, store leaves lightly packed in a glass jar away from direct sunlight. Try not to crush them to reserve the flavor until you are ready to brew your tea. Red raspberry leaf tea tastes like a mild green tea, but without the caffeine. To make the tea, use about 1-teaspoon of crushed, dried raspberry leaves per 8-ounce cup of boiling water. Steep for at least 5 minutes and drink like regular tea. 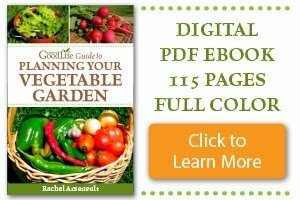 Want to learn how to use herbs as medicine? Check out the online courses at The Herbal Academy of New England: Introductory Herbal Course and Intermediate Herbal Course. Moerman, Daniel E. Native American Medicinal Plants. Portland, OR: Timber Press, 1998. Gladstar, Rosemary. Herbal Healing for Women. New York, NY: Touchstone, 1993. Stein, Diane. Healing Herbs A to Z: A Handy Reference to Healing Plants. Berkeley, CA: Ten Speed Press, 2009. White, Linda B. and Steven Foster. The Herbal Drugstore. Emmaus, PA: Rodale, 2003. Purchase Raspberry Leaf Tea from Starwest Botanicals on Amazon. I am not a doctor and the statements on this website have not been evaluated by the FDA. It is recommended that you consult your medical care provider or herbalist prior taking or relying upon any herbal product. Will the plant still flower and produce fruit if you harvest the leaves? Keely, Yes, the plant will produce if you don’t harvest all the leaves. I trimmed my raspberries plants recently because it’s been a rainy season. The ones I trimmed have been growing shoots with young leaves, they will of course not produced this year since it’s Minnesota but I don’t see why I shouldn’t be able to use the new leaves from brand new shoots. (Not a normal thing to happen in September usually it would already by cold.) I’ll try to do some, since I have to wait until growing time again, next year. When speaking specifically about when to harvest the leaves, you say spring , before the plants have bloomed. My question: it’s summertime, but I do have first year canes that have not produced fruit yet. Are the leaves on my first year canes during the summer just as potent for optimal use? Heidi, The leaves are most potent before the raspberries plants focus their energy on fruiting. The flavor also turns bitter once the raspberries begin to bloom. Since yours haven’t bloomed yet, you may be ok. You could give it a try and see how it tastes. It should taste like a mild, green tea. Do you know if you can use golden raspberry leaves instead of red raspberry leaves? Are they interchangeable? Amanda, The type of raspberries that are historically used for tea are the red raspberry plants with the latin name, Rubus idaeus. I don’t know if the golden raspberries have the same properties. Hello, have you harvest after all raspberries are gone? unfortunately my raspberries are already bloomed…. :'( and what is reason it’s shouldn’t be harvest when it’s bloom? ViVi, You can harvest leaves at any point, but the spring leaves are the freshest and healthiest. Once the raspberries begin blooming, the plants energy is directed towards fruit development and this can change the flavor and effectiveness of the leaves when used for tea. Wow, this is amazing! I have recently learned about the benefits of raspberry leaf tea and have raspberry plants in my backyard…I can’t wait until they start growing in the spring so I can use your tips to harvest the leaves. Thank you for the GREAT information!! 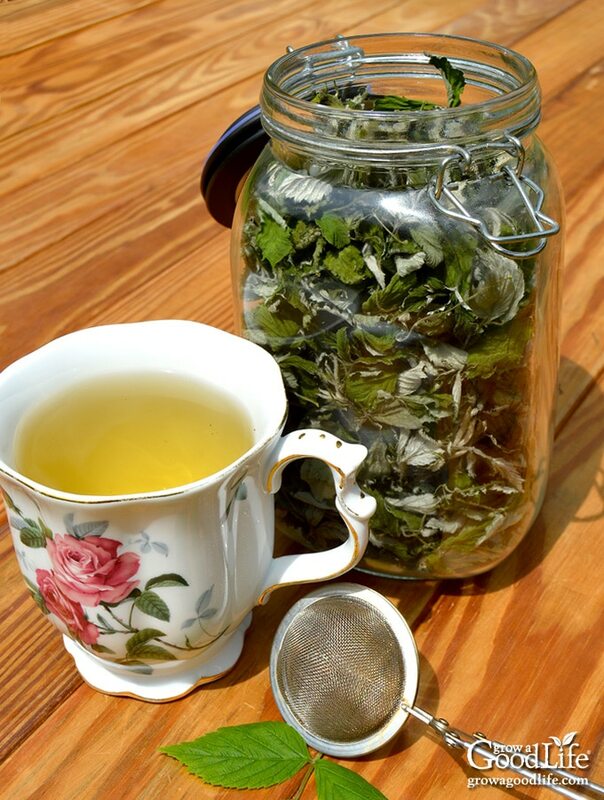 Do you know if you can make tea from ALL red raspberry plants or only certain types? Laura, I understand your excitement. I was thrilled that I had such a easy remedy right in my back yard. Any raspberry plant in the Rubus idaeus family can be used. What a great idea – I can’t wait to do this with my raspberry bushes. I share information about Red Raspberry leaf tea with my post partum doula clients. And I always have some on hand for my own family. Thanks for such an interesting and well done post at Wildcrafting Wednesday. Congrats on being a featured blogger. Congratulations on being chosen as a Featured Post on Wildcrafting Wednesday #185! What an excellent tutorial! 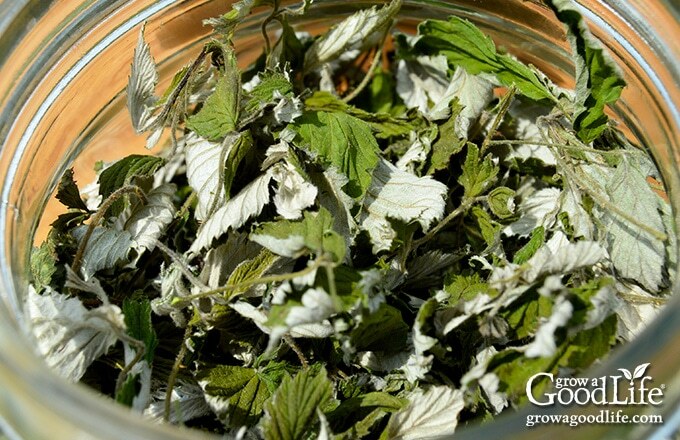 I am so delighted that you shared your informative and valuable insights on How to Harvest & Preserve Red Raspberry Leaf Tea with us at the Healthy Happy Green and Natural Party Blog Hop. I’m pinning and sharing. I have always bought my red raspberry leaf tea…it really never occurred to me to harvest my own! Thanks for the info! 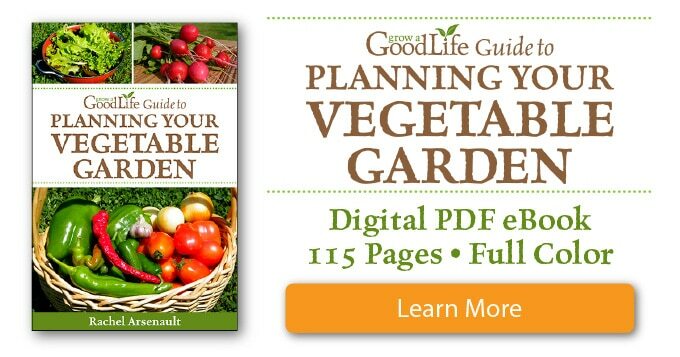 Thanks for linking up with Green Thumb Thursday. I hope you’ll join us again this week! Oh I didn’t realise all these health benefits of raspberry tea. Sounds wonderful. I will be sure to drink some of this now!! We have raspberries growing in our garden. I’ll have to give this a try when we thin our canes this year. Thanks for sharing at the Tuesday Garden Party. This is an awesome tutorial – love all the pics! Have some raspberries that haven’t fruited yet this year,so will be trying this! Do you know if all raspberry plants can be made into tea and if they have the same benefits? I have black raspberries too. And blackberries. Thanks! Red raspberry, Rubus idaeus is what I researched and use. It may be worth looking into other varieties to see if they share the same medicinal properties. Very helpful information! I drink a lot of green tea but I was not aware of this tea and it benefits. My sisters would love this information. Visiting from Marvelous Monday. Great idea to make tea from the leaves, I never thought of that! We don’t have raspberry bushes any more but I would love to plant some new ones! Great information. Thanks for sharing on Real Food Fridays. I did not know that Red Raspberry would relieve menstrual cramps. Pinned & twitted. I’m hoping to plant raspberries sometime. I’m happy to read this information. 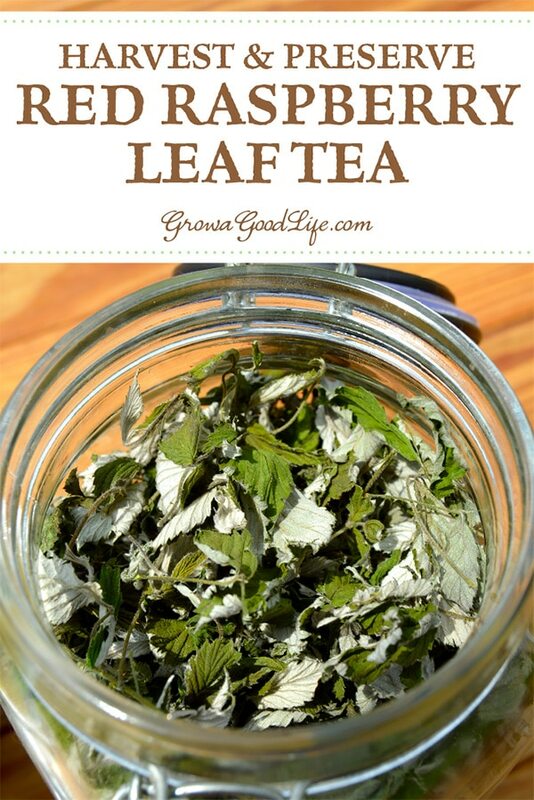 I use red raspberry leaf tea and it is helpful… I need to find a source for gathering my own leaves. 🙂 Thank you for the info. I can’t wait to give this a go – most likely next year. My newly planted canes are just starting to show some new growth at the base – well, most of them anyhow. That would be a good thing to collect when you are thinning the canes. I do that after the summer raspberries are done. I cut those out then thin the fall bearing ones. Of course my patch almost died since it was in a rain shadow. Since I’ve been watering it, it has come back well. Maybe I’ll get a chance to thin this year.